"...we can build a comprehensive and competitive 21st century clean energy economy that saves consumers money and gives our children a future without huge, damaging costs of unchecked climate change. A future of clean energy and cars, smart houses and clear skies is well within our technological and financial abilities.saves consumers money and gives our children a future without huge, damaging costs of unchecked climate change." The Union of Concerned Scientists is a non-profit organization that combines independent scientific research and citizen action to develop innovative, practical solutions and to secure responsible changes in government policy, corporate practices, and consumer choices. "Chairmen Waxman and Markey and distinguished Members of the Committee, thank you for this opportunity to speak with you today on behalf of the Union of Concerned Scientists. I am President of UCS, a national science-based nonprofit organization that’s been working for a healthy environment and a safer world for 40 years. I applaud the leadership of this subcommittee and the full committee for moving this issue forward at this critical time. And I’d like to thank Mr. Dingell and Mr. Boucher for getting the ball rolling in a thoughtful, knowledgeable and comprehensive way in the last Congress. Today I am pleased to share the results of a major study we’ve conducted to examine the energy and economic implications of a comprehensive suite of energy, transportation and climate policies that we call the Climate 2030 Blueprint. We used a modified version of the U.S. Department of Energy’s National Energy Modeling System for our analysis, with a baseline reference case that shows global warming emissions rising 13 percent above 2005 levels by 2030, and a clean energy blueprint case that leads to deep emissions reductions which put us on a path to stabilizing our climate and preventing catastrophic climate change. The results of this analysis show that we can build a comprehensive and competitive 21st century clean energy economy that saves consumers money and gives our children a future without huge, damaging costs of unchecked climate change. A future of clean energy and cars, smart houses and clear skies is well within our technological and financial abilities. Under the Blueprint, our nation meets a carbon cap of 26 percent below 2005 levels by 2020 and 56 percent below 2005 levels by 2030. We can achieve these emissions cuts cost-effectively by implementing a comprehensive set of smart energy, transportation, and cap policies. This comprehensive approach is similar to the one proposed by Chairman Waxman and Subcommittee Chairman Markey in their draft legislation. We can achieve these deep cuts in carbon emissions while saving American consumers and businesses $465 billion annually in 2030. The Blueprint also builds $1.6 trillion in cumulative net savings between 2010 and 2030. We can both reduce emissions on that scale and expand our economy between now and 2030, while keeping jobs growing at the same rate as in the reference case. We can cut the use of oil and petroleum products by 6 million barrels a day in 2030 – as much oil as we currently import from OPEC and 30 percent of our nation’s current total daily oil consumption. We can save consumers money on their energy bills because of increased energy efficiency, even though electricity rates and gasoline prices go up slightly. That means families will see average household savings of $900 a year in 2030, while businesses will, all together, save nearly $130 billion a year. Households and businesses in every region in the nation - even coal-dependent regions - will see lower energy bills. The electricity sector contributes more than half of the emissions cuts in 2030. We can reduce power plant carbon emissions 84 percent below 2005 levels by 2030. The Blueprint policies will also cut mercury, acid rain, smog and soot pollution, improving air and water quality and saving lives. We can cut emissions from cars and trucks by 40 percent compared to their 2005 levels and freeze emissions from freight trucks at 2005 levels even as the economy undergoes significant growth. The transportation sector contributes the second largest area of emissions reductions and accounts for one-half of the net consumer and business energy cost savings in 2030. The key to this success is the comprehensive policy approach we modeled. The transportation policies get us cleaner cars, cleaner fuels and better transportation options. The energy policies get us more efficient appliances and buildings, renewable energy and more efficient natural gas generation. A transparent and smartly-designed cap and trade policy assures the emissions reductions the U.S. needs to help avoid the worst effects of global warming. This comprehensive approach is so critical that when we stripped out the sector-specific energy and transportation policies in our analysis, the cumulative savings for households and businesses by 2030 were reduced dramatically - from $1.6 trillion to $600 billion. We did not find that all of these benefits will come for free. Energy costs may be slightly higher in the very early years as we make investments in the clean energy economy, but those investments will reap much higher savings for Americans in every region later on. Under the Blueprint policies, households and businesses will actually start paying less on their energy bills by 2013, because reductions in usage from energy efficiency more than offset the modest increase in energy prices. In transportation, there will be more upfront investment, but consumers and businesses will get even more back later as they save money on gas. Overall, the investments made early on (from 2010 to 2015) for efficiency, renewables, cars, and so on will start saving us money by 2015. We have an historic opportunity to reinvent our economy, to make it more resilient and efficient – and to produce a bow wave of new high quality, well paying jobs, especially in regions that have strong manufacturing capacity, a seasoned, able labor force, and needed resources and infrastructure. In this new homegrown economy, we need people to build wind turbines, weatherize and retrofit homes, install solar panels and manufacture advanced cars and fuels, as well as to design, transport, maintain, repair, market and sell all of the above. In my travels around the country, I hear a growing call for a new clean energy economy that is designed to also solve large, stubborn problems by reducing our dependence on oil, making us less vulnerable to blackouts, creating jobs, tackling climate change, and improving our families’ health. We know that if we continue down a path of no action our risks and vulnerabilities will increase, leading to significantly higher costs than if we act boldly today. The status quo is not an option. Our analysis makes a compelling case that a forward-looking, comprehensive set of policies will jump-start the transition to a clean energy economy. The Waxman-Markey draft legislation capably starts us down that path." If you are working on or interested in environmental issues check out San Antonio Green Drinks, a forum for fun, contacts, info, gossip, inspiration, business and pleasure. An international phenomena Green Drinks is a monthly, informal networking event for environmental professionals and anyone interested in “green” things. It started in a north London pub, the Slug and Lettuce, when Edwin Datschefski, sitting with his green design colleagues Yorick Benjamin and Paul Scott, noticed an environmentally-minded acquaintance who was was sitting with his own ecology-conscious pals. They pulled some tables together and a movement was born. Today gatherings are held in almost 500 cities around the world and the Green Drinks Facebook Group has over 4000 members. In San Antonio, Green Drinks was started by Michelle and meets the 1st Tuesday of each month at 7 pm. At the San Antonio Green Drinks page or San Antonio Environment Meetup you can find out details about the May 5 Green Drinks at Champps Americana, 11075 Ih 10 W San Antonio, TX 78230 in Huebner Oaks, which will include a visit with Derba from Clothesline Cleaners, a natural alternative to dry cleaning. Northwest artist and builder Sun Ray Kelly calls the woods the "Supernatural Market". In Wales, Simon Dale went to that supernatural market for materials for his home which in many ways is reminiscent of Kelly's work. The family home was built into a hillside and uses spare wood from surrounding woodlands along with lime plaster and strawbales. The home is truly beautiful. Check out his website: A Low Impact Woodland Home for more information. Express News energy news: CPS embraces smart meters and estimates cost of new nuclear project at $22 billion. SASL member Joe Barfield points out that there is is quite a bit of energy news in today's San Antonio Express News. In the Business Section there's "CPS to get smarter" concerning CPS and smart metering. On the front page there's "Nuke Plan may cost $22 billion". Labels: Energy Conservation, Government, San Antonio. SASL member Tony Stephenson points out this opinion piece from Australian conservative commentator, columnist and associate editor of the Melbourne Heral Sun, Andrew Bolt entitled "If the world is warming, why are we so cold? ". You can't furnish a house with these designs from Foldschool but you can make a cute child size chair, stool or rocker. These designs use waste cardboard. Plans and instructions can be downloaded free of charge, though donations are welcome. If you have access to a large format printer there's a special version of each plan for you. Otherwise the plans can be printed onto a standard letter size printer. The furniture available through Foldschool is designed by Swiss-based architect Nicola Enrico Stäubli. He is living and working as an independent architect, designer and bike messenger. Foldschool is his first mass product, cardboard furniture hand-crafted by the consumer. A papercrete building doesn't just just spring to life. It takes plenty of work. The blog Puerto Viejo to Big Bend by Noble Baker and Alaine Berg documents the work being done to build their "joint" in Marathon, Texas with a papercrete arched shower, more papercrete domes, walls and arches. They are making regular entries so you will be able to follow their progress. Even more important they are logging their hours so you can see just long it takes for a hand built house. Was Goff green? Was Goff sustainable? Regardless "Goff in the Desert" will amaze. Bruce Goff may be well know among architects but he isn't among mainstream fans of architecture. The film Goff in the Desert by German director Heinz Emigholz explores 62 of the more than 150 structures that were designed and built by Goff between 1920 and 1982. Goff's work ranges from the art deco beauty of the Boston Avenue Church in Tulsa to the innovative and attractive works of his later years such the Frank family home built with Frankoma tile . In theaters this film consisted almost entirely of static shots of the buildings without commentary. The soundtrack is whatever sounds the camera picked up, which includes lots of traffic. After watching the DVD be sure to listen to the director's commentary. The German director's take on Goff and the United States is quite interesting. The director mentions that they never knew what to expect when they pulled up to a Goff house to film. You will feel the same way as you watch this film. Though Goff was fond of certain elements such as an extremely open floor plan, multiple levels, round sunken sitting areas in front of fireplaces, covered patios, and unusual roof lines, he did not repeat himself. Each house is a surprise. You can learn more about his philosophy at the Duncan Castle of Cobden Illinois which is operates as very reasonably priced B&B. The fact that so many of these houses were built in places where one would not expect to find unusual architecture speaks to Goff's persuasive personality. So was his work green and sustainable? Goff liked to re-purpose industrial items for his homes and he certainly took advantage of daylighting but it the film does not address his interest in what we would call green issues today, so the question is open. Nevertheless, if you are a fan of the innovative and beautiful be sure to add Goff in the Desert to your Netflix queue and watch it twice, once without commentary and once with. In this video, Geoff Lawton of the Permaculture Research Institute of Australia introduces the concept of the Food Forest. This is a small part of the DVD Establishing a Food Forest, which is available as a region free DVD that is playable worldwide. Unlike their Harvesting Rainwater DVD, this is in the NTSC television format which makes it viewable on US televisions. COPS/Metro Alliance wants CPS to be required to look into green energy as alternative to more nuclear reactors. "CPS Energy proposes expanding the South Texas Nuclear Project to two more nuclear reactors as the next source of electricity for San Antonio. COPS/Metro leaders will insist on a public dialogue that considers what similar investments in solar, wind and other sustainable sources of energy would mean for our city. Investment in "green energy could bring jobs and economic development to San Antonio." After their agenda was presented each candidate was given the opportunity to state whether they would support 11 specific questions policies arising from the agenda. Candidates for mayor, Deberry-Mejia, Julian Castro, Sheila McNeil, and Diane Cibrian all stated that they would "Require that CPS Energy presents alternative plan for solar and wind energy." Labels: Government, Local Organizations, Renewable Energy, San Antonio. Dr. Joseph Lstiburek,principal of Building Science Corporation has posted a piece provocatively titled "Joe's Top Ten List of Dumb Things to Do in the South". No, it isn't about putting peanuts in Coca-Cola or driving up and down Main Street. It is about 10 building practices that Dr. Lstiburek thinks are inappropriate for the southern areas of the US. The list includes materials, insulation practices, barriers to vapor and several related to air conditioning and heating. Thanks to SASL member, Joe Barfield for adding a link to Dr. Lstiburek's article to our SASL Facebook group. Our April meeting, tomorrow features a presentation by Earth Wise Organic Pest Control. They feature strategies that include alternative treatment which is less harmful to people and pets than treatments utilized by conventional pest control services. As usual, we will begin the meeting Tuesday evening at 7pm in the classroom inside Whole Foods Market in the Quarry Shopping Center. Hope to see you there. 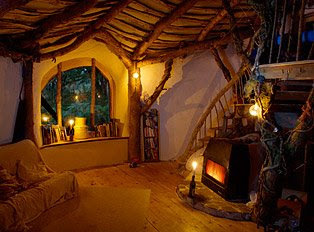 How do you experience living in a home built with sustainable materials without building your own? One way is to stay at one of a growing number of green B&B's. 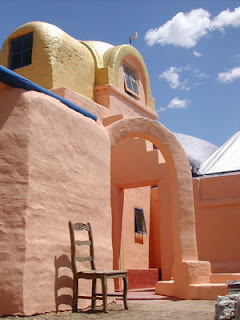 In Marathon, Texas a short 30 minute drive from the Amtrak station in Alpine and 2 1/2 hours from the airport in Midland Eve's Garden Bed and Breakfast features papercrete domes and arches. Eve’s Garden is an organic bed and breakfast which features an organic garden and locally produced food. 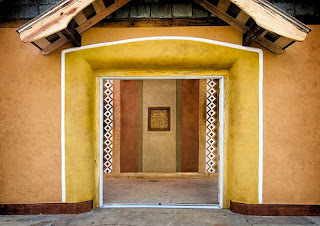 The buildings themselves feature recycled content, papercrete and strawbale construction. Rooms rent for between $195 and $155 per night. Geoff Lawton of the Permaculture Research Institute of Australia, reflects upon the success of Greening the Desert. "It's probably the most beneficial and productive 5 minutes we've ever created in our permaculture career." says Lawton. In this short video he gives more details about the Jordan Project and goes into what happened to the project after the original video was made. 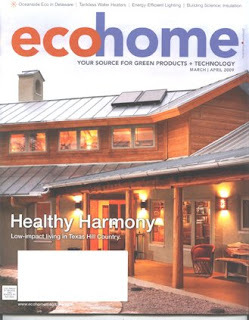 Austin LEED Platinum home makes EcoHome Magazine cover. The March/April 2009 issue of ecohome magazine features an Austin's first LEED platinum home on the cover. The 3, 082 square foot home designed by LaVerne Williams of Environment Associates of Houston features aerated concrete walls, rainwater catchment to meet all household needs and mud plaster created by Design Build Live's own Frank Meyer, the Thangmaker. Fortunately the article "Living Off the Land" is on line. EcoHome published by Hanley Wood is a trade publication for residential builders, remodelers, designers, and product specifiers . Their website features news and links to reviews, articles and educational pieces that would be of interest to people outside the trade. It can be viewed without needing a subscription to the magazine. To see if you qualify for a subscription follow this link. Biodiesel Magazine has placed a map of biodiesel manufacturing plants in the US and Canada online. It shows plants that are operating, idle and under construction. The map shows 11 operating plants in Texas including the SMS Envirofuels Inc soy oil plant in Poteet, the GeoGreen Fuels soy oil plant in Gonzales which was recently purchased by Encore Energy Systems, and Central Texas Biofuels in Giddings which uses yellow grease. (Free but necessary) tickets to San Antonio Green Camp May 9 still available. As of last Saturday, April 18 there were still tickets available for San Antonio's first Green Camp to be held May 9 on the grounds of the former Pearl Brewery. Tickets are free but you must register and obtain one to attend. See our March 25 post An Unconference. Learn from and teach your green peers, exchange ideas and start solving problems for more information and links. Labels: Events, green, Local Organizations, San Antonio. Geoff Lawton of the Permaculture Research Institute of Australia narrates this short segment about a project in the Jordan desert, an area of 6 inches of rainfall a year. Using passive rainwater harvesting, mulch, micro-irrigation and careful selection of plants they were able to transform the desert. This is one of the most hopeful pieces you may ever see on YouTube. Greening the Desert, is a segment from Water Harvesting the Permaculture Way, which although it is a region free DVD that is playable, is only available in the PAL television format, which is not used in the USA. SASL member and small scale chicken farmer, Joe Barfield asks the question "Can you have chickens in San Antonio?" and answers in the affirmative. He has a complete analysis of the applicable city ordinances and regulations on his blog, Joe's List- San Antonio's finest original music, art, and culinary events. The Daily Climate: Golden State may rule corn ethanol no solution to climate change. An April 20, 2009 article by Mathew Cimitile on The Daily Climate, also appearing on the Scientific American site examines the debate in California over the effectiveness of corn based ethanol in reducing green house emissions. California regulators are required to assess the full life cycle costs of corn based ethanol, including indirect costs. Thanks to San Antonio Sustainable Living member Tony Stephenson for suggesting this topic on the SASL Facebook group homepage. S A Express-News reporter Anton Caputo's April 21 article S.A.'s 50 year water plan. Who has the final say? addresses the disagreement between former city manager and current SAWS president Alex Briseño's and SAWS staff concerning whether the city council's approval ought to be sought for the 50 year water plan currently under consideration by the city owned utility. Labels: Government, grey water, San Antonio. WaterFurnace International CEO Bruce Ritchey makes the case for geothermal air conditioning and heating in this informative presentation. After watching the video be sure to check out our posting on the municipal-water system based geothermal from Encore Energy Systems which eliminates the need for a ground loop entirely. San Antonians are lucky to have shrimp available, whose growth and harvesting is sustainable and which doesn't result in pollution. Natural Shrimp International located in LaCoste has developed methods that allow self-contained, chemical free growth of shrimp in an environmentally responsible way, using metered water supplies. Currently their shrimp is available in large quanitities by special order and to the general public at the Pearl Farmer's Market each Saturday. The company sells its shrimp fresh and has plans to build farms near other major metropolitan areas. Since their process does not require access to the ocean their plants can be built inland as needed. 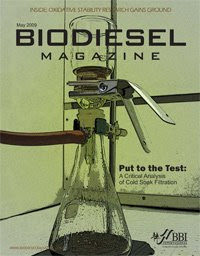 Biodiesel Magazine meant for insiders but of interest to others. Biodiesel Magazine is a trade publication covering all aspects of biomass based industry though emphasizing biodiesel. A large portion of the magazine is available online. A recent article included coverage of an attempt by Mission NewEnergy based in Perth, Australia to establish Jatropha as a biofuel feedstock in India. News and articles concerning technical issues such as "Minimizing Oxygen's Destructive Tendencies" round out the issue. Although obviously intended for those involved in the business, people with an interest in an inside view of alternative energy will find plenty of items of interest. Concrete Canvas makes for a building in a bag and much more. Here's another option for a quick building, Concrete Canvas. Concrete canvas is essentially fabric impregnated with concrete and backed with a PVC baking. The fabric is put in place and wet down to form a hard concrete surface. It can be used to reinforce gabion walls, to quickly create a concrete lined channel, or to make a hard surface for driving or flooring. The canvas aka concrete cloth can also make a structure. The cloth is moved about the site by forklift, pulled out and placed in position with the help of a vehicle, inflated by fan, sprayed down with water and then becomes usable within 24 hours. The material was invented in 2003 , can be repaired with concrete or patches of concrete canvas and has an expected lifespan of 10 years. It is already in use by the British armed forces. Dr. Menandro N. Acda, Associate Professor and Chair of the Dept. of Forest Products and Paper Science, College of Forestry and Natural Resources, University of the Philippines Los Banos, Phd. Oregon State University has been mixing chicken feathers with cement to form a decay resistant non-structural wall board. Though the project is in its infancy, if successful it would help to deal with the 2.5 million pounds of waste chicken feathers generated each year in the Philippines. Currently much of that waste is simply burned. Chicken feathers contain keratin which is an extremely hard protein which is also very hard to dissolve. Keratin is not digested by termites. 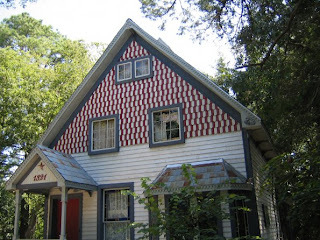 Over the years several groups of people have attempted to establish co-housing in San Antonio. Creating co-housing is almost always a long process. A current San Antonio Co-Housing effort is led by Jason Winn. The group is currently in the process of discerning what sort of community they want. They are looking for ways to encourage a private developer to include a co-housing model in a project and/or looking to establish a space-sharing arrangement with a non-profit entity. One problem with co-housing has to do with financing and these approaches may help them work around it. They are considering what areas in general they would like to be in. At this point they are most interested in areas with walkable neighborhoods and essential services (food, public transportation, health clinics), which means the older neighborhoods. They are also trying to envision an ownership model that will work for them. Is it co-housing with individual units and a central building which is most expensive. co-operative single building with common kitchen which would be more affordable but which is harder to finance, or a model of living in the same duplex, fourplex or several of them nearby which would allow for the most flexibility. Co-Housing is a form of intentional community, which is often part of a move toward a more sustainable society. In a co-housing community, storage, workshops, a community cooking and dining facility or child care facilities may be shared. Usually the housing units can then be smaller than they would be otherwise. The San Antonio Co-housing Yahoo Group has some discussions from 2008 that you might find useful. But be sure to email Jason Winn directly to learn current information. Expandable managed-water-system based Geothermal cuts HVAC bills in half without need for buried ground loops, (possibly for an entire town). With the DeMarco patented system (patents #6604376 and #4538418) from Encore Energy Systems and American GeoThermal Systems you don't need a buried horizontal water loop field or a series of vertical dry wells connected by pipes. Instead it uses the otherwise wasted thermal properties of water in the mains. The DeMarco Energy Miser System features an heat exchanger that transfers heat or cold from the municipal water supply to a closed loop system inside the building. Without a buried geothermal pipe system all the benefits of geothermal HVAC system are still obtained: low operating costs, flexible temperature zoning, high efficiency even when temperatures outside are at extremes, and free hot water heating during the cooling season. But the system has one more benefit: it is scalable. To add capacity to a ground loop system another ground loop must be buried but with the DeMarco system a valve is merely adjusted to allow more flow from the municipal water supply. The system works using effluent, grey water and recycled water (such as that which SAWS distributes to industrial users) as well. To test the system the company chose locations with extreme weather. Fort Irwin National Training Center (Dry Heat of the Mojave Desert), Winner School District 59-2 in South Dakota (Extreme Cold) and the Marine Corp Air Station at Beaufort, South Carolina (Extreme Humid Heat). A study by R Gordon Bloomquist, of Washington State University, for the Department of Energy (Municipal Water-Based Heat Pump Heating and/or Cooling Systems DOE /ID/13480--T/) found that such a system would not adversely affect the water system from which it drew heat or cold. You can view and download a copy of the report from the OSTI.gov or Science Accelerator site. Since the system requires the cooperation of a water provider, the initial prime market is state, federal and city owned buildings, large campus facilities, entire smaller cities or communities, buildings centrally located in the water distribution network, large master planned communities and sites with grey water or reclaimed water supplies. But once a water utility had experience with it, they might be inclined to allow individual homeowners to install it as well. Several years ago our members heard about community wide geothermal from Victor DeMarco. The work seems to have progressed and seems to be gaining some momentum. The 2009 Biomass Conference and Expo in Portland Oregon includes information on power generation, fuel and chemical production from biomass. Program tracks through numerous workshops and seminars include those focused on Crop Residues, Dedicated Energy Crops, Forest and Wood Processing Residues, Livestock and Poultry Wastes, Municipal Solid Waste, Urban Wastes & Landfill Gas and Food Processing Residues. Technologies explored include gasification, combined heat and power (CHP), anaerobic digestion, pyrolysis (a form of incineration that decomposes by heat without oxygen)and advanced biofuels. In addition to the workshops and seminars the conference will feature tours of area biomass energy producers including Summit Natural Energy which converts waste from 400,000 tons of baker grade dried berries from Summit Foods Inc into 2 million gallons of ethanol a year. Going Green with Yolanda Green airs on Houston's KIAH Channel 39, but we can watch it at 39online.com. The show is professionally produced. Yolanda is a knowledgeable and affable host. Although aimed at a Houston audience, viewers elsewhere will find plenty of good information. They call it eco-tainment. From ÖKO-Logic in Germany comes a well insulated window that spins to allow you to set it with the seasons. In the winter setting it accepts 70% of the sun's heat. In the summer setting it reduces penetration of the sun's heat producing rays by 70%. 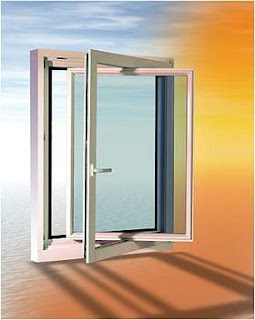 Not only is this window efficient, it can be switched from a winter position in which it gains heat to a summer position in which it rejects heat. The KSD window has six layers: white glass, SZR with argon gas, low-E-coat, float glass, Foil and green glass. In the winter the green glass layer is on the inside. In the summer it is on the outside. * Example: Already at 100 watts of solar energy in the winter time (cloudy sky) and at outside temperature of 32 degrees Fahrenheit, the inside window pane heats up to over 70 degrees. As a result a thermal barrier is created and no energy is lost through the window, effectively reaching a U rating of zero. The video below features a demonstration of the window at a European trade show. 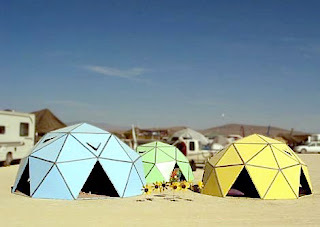 Three people, four hours, appropriate tools and materials can net you your own backyard geodesic dome. In addition to creating products which help you communicate in the Burmese, Thai, Lao and Thai languages the folks at Fetch-a-Phrase, have put instructions on how to build a recycled cardboard geodesic dome on their website. Of course the dome is not entirely made of cardboard. You will also need wood, rebar, some bolts and some basic tools among other items. 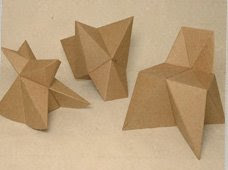 It isn't quite origami with cardboard so be sure to read the instructions thoroughly and assemble all the tools before you assemble your friends to help you. You will need to make several tools yourself to help in the construction of the dome itself. The plans on the site lead to a dome that is six foot three inches at the peak with a 12 foot 7 inch diameter. In the picture above it is the blue one. Listen to an interview with Jonathan Smith about why he and his friends chose to build the domes - Small World Podcast. Within living memory in the river city of San Antonio, most of our creeks and rivers have been little more than drainage ditches with names. At Earth Day in Woodlawn Lake Park, Saturday April 18 from 10 a.m. to 4 p.m. in the Woodlawn Lake Gymnasium, SARA will be hosting an Imagination Station where we will be encouraged to envision the future of the creek. We will be given the chance to imagine parks, hike trails, bike trails and recreational facilities. As former president of Medallion Homes, John Friesenhahn knew something about building energy efficient production homes in suburban San Antonio. When he founded Imagine Homes in 2006, he took that knowledge with him. Today, Imagine Homes have many green building features seldom found even among custom builders in San Antonio. Of course the toilets are low flow, but Imagine Home installs low flow dual flush units to save even more water. Water heaters are on demand units, but they also use a structured plumbing system to minimize the amount of cold water that has to be flushed out before the water becomes hot. They have embraced the closed attic system and now insulate attics as well as walls with Demilec Agribalance foam, resulting in a semi-conditioned attic in which to place duct work. Low e windows improve efficiency while low VOC paint reduces air pollution. Each bedroom has either a return air vent or a transfer grill to make for better flow of conditioned air. The HVAC system features programmable thermostats and maintains a slight positive pressure to keep outdoor pollutants outdoors and to push indoor pollutants out. Each house is blower door tested. You may have missed Express-News writer Anton Caputo's January 2009 article on the opening of what will be part of the largest concentration of wind power generation capacity in the world. Two wind projects in Kenedy County will have a capacity of up to 900 megawatts. On the Earth Matters Express News Blog, Anton expanded upon the information in his article. He included a link to a Brown and Babcock presentation in pdf form on the measures they have taken to avoid killing migratory birds. Steel framing is recyclable and with proper insulation it poses no problem for thermal bridging. Foam panels make great insulation but of course they are not load bearing. 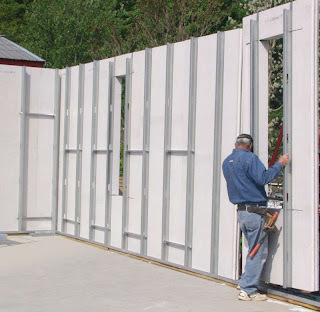 A number of companies have combined steel framing with foam insulation in various forms. One such company is Accelerated Building Technologies of Pennsylvania. Their product embeds cold rolled steel framing into extruded polystyrene. They call it Steel Thermal Efficient Wall Panels (STEP). The steel framing extends to the inside of the foam leaving a cavity for mechanical systems, plumbing and electric in accordance with open design principles. Drywall can be attached on the inside surface. The system lends itself to conventional style buildings, though there are some design principles to keep in mind, such as avoiding sloping load bearing walls and wall lengths of less than 3 feet. How about a Bamboo Fence instead of chain link, or lumber? You may have heard of bamboo flooring and bamboo used instead of plywood for cabinets, but Cali Bamboo offers a line of bamboo fencing. It can be used to rehab an existing wood fence, added to a chain link fence or used on its own. Their fencing system uses posts and crosspieces. The spaces in between are covered by rolls of stitched together bamboo. I'm not sure if it would keep a dog in the yard but it stops prying eyes and is beautiful. Their products can also be used to create your own personal Gilligan's Island room. Many pages on their site use audio and video that loads and plays automatically so be sure to turn off your computer sound before you go there if you are in a quiet environment. Closer to home, BigGrass Bamboo at 637 West Hildebrand has a wide selection of bamboo decor items. When the office space of Build San Antonio Green was built out they went to extraordinary lengths to use a variety of green and sustainable materials for interior walls and flooring. The BGSA website has a clever interactive drawing of their space showing the green and sustainable material used. Among the wall materials used are sips, various forms of insulated concrete forms, autoclaved aerated concrete and compressed earth block. The compressed earth block was only used for a few courses of a wall though, because the weight of a full earth block wall is quite a bit too heavy for a foundation that has not been engineered for it. Among the flooring used are: sisal mats, bamboo, cork, wool carpet, recycled content carpet, sealed concrete and linoleum. Labels: Build San Antonio Green, Local Organizations, materials, San Antonio. Green Spaces Alliance of South Texas, a non-profit, non-governmental land trust works with landowners to preserve open space by conservation easements in the San Antonio area. Landowners decide what about their land they want to be preserved and what uses they want their land to be put to. Green Spaces works with them to develop conservation easement agreements that accomplish the landowner's goals. Green Spaces has worked to preserve large parcels for scenic views, open space, passive recreation, historic and cultural preservation, and protection of the Edwards Aquifer. 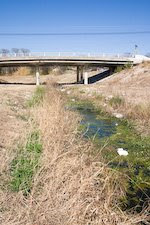 Among their accomplishments are the aquisition of three conservation easements in Bexar and Kendall counties., the aquisition of 1,681 acres of land for the City of San Antonio’s Aquifer Protection Initiative under the Proposition Three Program and 20,000 acres so far under the 2005 Proposition One Aquifer Protection Initiative. They helped organize and lead the coalition of 23 entities that form the Land Heritage Institute that will preserve the 1,200 acre Land Heritage site in southern Bexar County and have funded and facilitated nine community gardens in San Antonio and have helped over 30 other gardens get started and grow. Their "Picture Your World Youth Photo Project" has taken hundreds of kids into nature, taught them new skills, given them pride, and will make them better stewards of the land. Two seminars for land professionals each year, public lectures, member hikes, and events educate the public as to the need for preservation of our unique natural and cultural heritage. They have a membership program and numerous volunteer opportunities. They are involved with the Eco Fashion Show, Wednesday April 22 from noon to 1 pm at Whole Foods in the Quarry, with a silent auction to follow the show from April 22 to 26 to benefit Green Spaces . In San Antonio's twenty one historic districts, the city Historic Design Review Commission allows homeowners to repair wood frame windows which can make them more efficient and less wasteful of energy. The UTSA College of Architecture and the City of San Antonio Office of Historic Preservation will host an educational night "Window on Preservation" featuring discussions with experts on preservation and restoration at the AIA Center for Architecture at the Pearl Brewery, 200 East Grayson Ste 100, on Thurday May 14 at 6:30. This event is free. They also will host two paid Historic Windows Workshops . A $195 one day workshop for homeowners interested in learning how to repair windows themselves and a two day $295 course for contractors which will earn them a San Antonio certification in wood window repair. The paid courses will be taught at historic Fire Station #1 at 323 South Frio, 78207 which is in the process of being restored for use by UTSA. A Friday May 15 session beginning at 9 am will focus on the basics of repair and restoration using the Fire Station windows for a hands-on learning experience and is open to paid homeowners and contractors. The Saturday, May 16 session beginning at 9 am is open only to paid contractors or professionals interested in advanced training on wood window restoration. Participants will be certified by the City of San Antonio in wood window restoration at the end of the session. Labels: Energy Conservation, Events, Government, Pollution, San Antonio. Although it is open to the public, the cost ($295 before April 13/ $345 afterward) and the subject matter of presentations many having to do with obtaining permits and complying with regulations, means the TCEQ Environmental Trade Fair and Conference is primarily meant for Attorneys, Professional Engineers, MSW Technicians and Supervisors, Public Water System Operators, Wastewater Operators, Professional and Registered Sanitarians and Professional Geoscientists, and LPST Corrective Action Project Managers. The 2009 TCEQ Environmental Excellence Awards will be presented as part of the conference on Wednesday May 13, 2009. Tickets to the awards are $50. Among this year's honorees will be Build San Antonio Green. Recycling Rules Forum a Discussion of exemptions from the definition of solid waste and permitting for recycling activities presented by Jesse Boultinghouse. An Overview of the San Antonio Water System’s Desalination Project by Kevin Morrison, San Antonio Water System. Environmental Issues on the Texas-Mexico Border Area Highlighting challenges and success stories. Presented by Victor Valenzuela, Steve Niemeyer and Carlos Ayala, Cameron County Drainage District No. 1 . US-Mexico border presented by Jerry Peterson, Texas Department of Transportation (TXDOT) and Michael Blumenthal, Rubber Manufacturers Association. Stop Illegal Dumping Strategic solutions to illegal dumping in McLennan County, presented by James Pack, McLennan County Sheriff’s Office. in the rain water harvesting and fire flow rules, presented by Cindy Haynie, TCEQ. Builders Without Borders has created an exhibit on the grounds of the US Botanical Garden in Washington D.C. as a showcase for natural building. 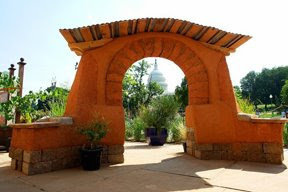 In addition to the small one room structure a hardened adobe arch frames a view of the Capitol. 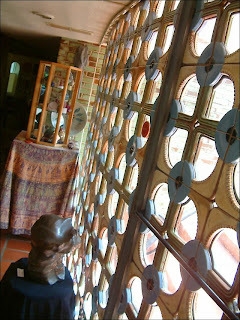 Lime plaster, cotton roof insulation, a standing seam metal roof, a truth window and a bamboo trellis are all featured.